Christmas decorating isn't complete until I've set up my little Barbie Tree! 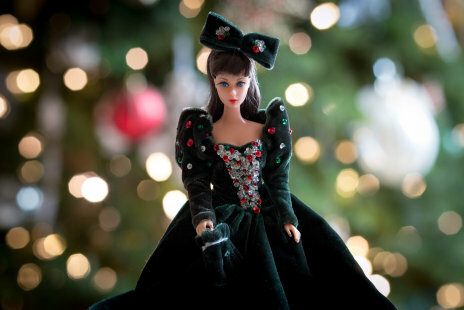 Do you know when the very first Christmas movie Barbie debuted in? It wasn't until 2008. 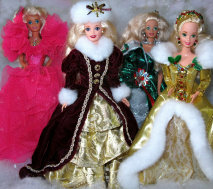 She starred in the animated film "Barbie - A Christmas Carol"
Barbie like all the rest of us, loves a great party. 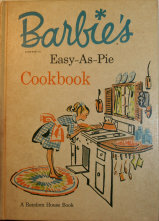 Here are some of her favorite Christmas recipes she prepares from her "Easy as Pie" cookbook. 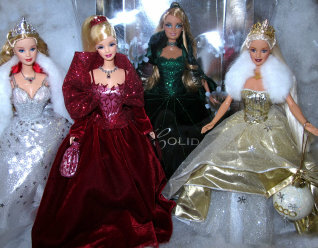 Besides the Happy Holidays series, there have been many dolls from other collections: Holiday Dolls, Holiday Visions, More Special Occasions, and Winter Princess Collection. 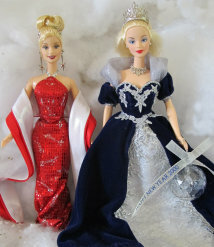 The first Hallmark Barbie Christmas Ornaments debuted in 1993 with the release of the 1993 Holiday Barbie Red Dress ornament which was a replica of the 1993 Happy Holidays Barbie. The Happy Holidays series began in 1988 and the last doll was released in 1998. 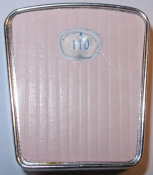 Barbie never had to worry about gaining a pound at Christmas time because her bathroom scale was set to 110 pounds permanently! 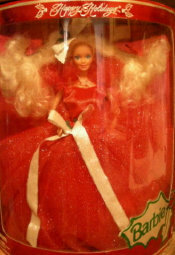 The very first "collectible" Barbie happened to be a Christmas Barbie Doll: The 1988 Happy Holidays Barbie. Click here for a close-up look at all the Happy Holidays Barbies! Click here for a close-up look at all the Holidays Barbies that were released!